HCM City (VNA) – The High-Level People’s Court in Ho Chi Minh City on March 18 upheld imprisonment penalties given to five defendants for “attempting to overthrow the people’s administration”. The defendants include Luu Van Vinh (born in 1967, residing in Binh Tan district of HCM City), Nguyen Quoc Hoan (born in 1977, residing in district 10 of HCM City), Nguyen Van Duc Do (born in 1975, residing in Tan Phu district of HCM City), Phan Trung (born in 1976, residing in Duc Trong district of Lam Dong province), and Tu Cong Nghia (born in 1993, residing in Ninh Thuan province). According to the verdict of the first-instance trial on October 5, 2018, they established a reactionary organisation named “Lien minh dan toc Viet Nam” (Vietnam National Self-Determination Coalition) with Vinh as its President. They defamed and distorted guidelines and policies of the Party and the State, aiming to abolish the leadership role of the Communist Party of Vietnam and overthrow the State of the Socialist Republic of Vietnam. As the mastermind, Vinh set forth the objectives and orientations for operations of the group and lured people into this organisation. Do, who was Vice President, worked actively to develop the organisation. Meanwhile, Hoan and Trung served as advisors to Vinh in the group’s establishment. Nghia was in charge of “military affairs” and recruiting people into the group. They carried out various communications activities to incite the public, coordinated with dissidents, and participated in illegal demonstrations. On October 30, 2016, they held a preparatory meeting and agreed to announce the debut of the organisation at a church in Tan Binh district of HCM City on November 6, 2016. However, Vinh and Hoan were arrested by local police on November 6, 2016. 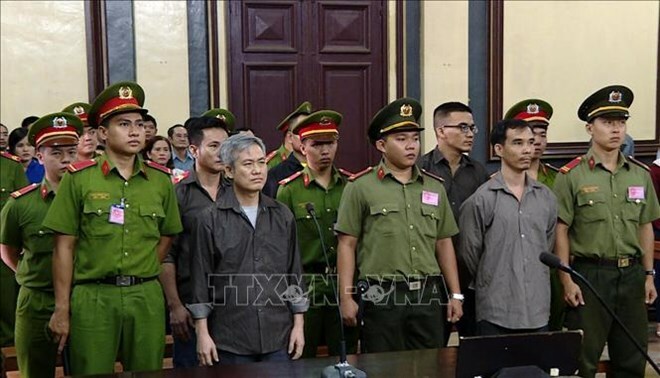 At the first-instance trial, the HCM City People’s Court gave prison sentences of 15 years to Vinh, 13 years to Hoan, 11 years to Do, 10 years to Nghia, and 8 years to Trung. They would be also kept under surveillance after completing their jail sentences.